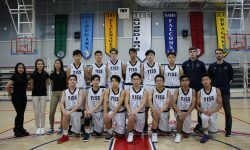 Expectations were very high for the 2013-14 basketball season, as the guys entered the season with 8 seniors, 4 of them returning starters, Justin Kang, Chris Yoo, James Bai and Sam Kang. Senior that would back them up were Jihoon Park, Jae Park, Jared Swanson and Collin Scott. Xavier Sawyer also looked to follow up his amazing freshman year with another solid year. The guys started the season with a loss to a very good SIS squad. The same week, the guys blew an 18 point lead against rival Daegu and lost at the buzzer. That would be an accurate representation of the season, with the boys only losing to SAHS and DHS, all of which were close games. The season included more historic wins against SFS (twice), TCIS and Osan. The guys looked forward to the tournament to once again make a run at the finals. After defeating SFS handily in the opening round, they would meet Daegu once again, a common theme throughout Guardian boys basketball history. This year, the Warriors would get revenge for the 2012-13 tournament semifinals, in which the Guardians’ James Bai beat them at the buzzer. This year, the boys blew a 4 point lead in the last minute of the game. With a 1 point lead in the closing seconds, Daegu’s William Steele made a lay-up to put the Warriors up as the buzzer sounded. The guys would go on to beat Osan to match their season standing at 3rd place. ACSC would be a new experience for the guys, and it was a great one. While the tournament was disappointing from a basketball perspective, losing very close games to St. Paul, Grace, and Morrison, it was a valuable team bonding and ministry time. The boys came away with wins against ICS-HK and Dalat, taking 5th place overall. However, it was the opportunity to serve at KIDS Ministries at the orphanage and making and distributing food in a poor neighborhood. The boys also had the chance to hear testimony from legendary basketball player and coach Tine Hardeman. Overall, it was an amazing experience of team bonding and life changing.